The research of optomechanics in our lab is to advance the understanding of light-matter interaction and gradient optical forces through the design, fabrication, and characterization of engineered photonic structures. 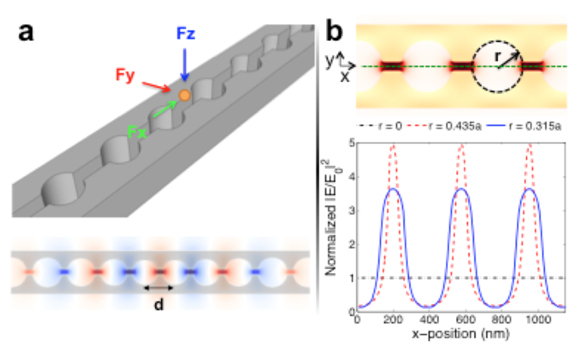 Discovering strategic approaches for enhancing light-matter interaction and creating and controlling gradient optical forces is likely to open new avenues for enhancing the capture and detection of biomolecules, amplifying optical forces and optical sensitivity to mechanical motion, and realizing ultra-high sensitivity optical cavities that could form the basis for compact and energy efficient modulators and lasers. (a) Dielectric constant plot of MHD simulation space, where black indicates ε = 12, white indicates ε = 1. Detailed MHD regions with effect radius (b) 0.2a, (c) 0.3a, and (d) 0.4a are also shown. The defect hole radius in all cases is 0.04a, with defect hole spacing 0.12a.